I love this idea from the New Zealand outdoor clothing brand Icebreaker. 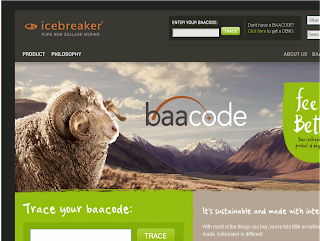 Each of their merino wool products (sweaters, t-shirts etc) now comes with its own 'Baacode' which you can use to look up exactly where the wool came from, right down to the sheep station. Then you can see a video of the station itself, and the farmers. There's a demo here. Via the ever-reliable Springwise Newsletter.